Locate and show where the vehicle is by using Google Maps on a smartphone from anywhere in the world, remotely lock/unlock doors, open trunks, starter cut, start or stop the engine, arm/disarm the security system, and receive alarm alerts and status checks using iPhone and Android OS smartphones. . Provides real-time vehicle locating on smartphone via Google Maps. 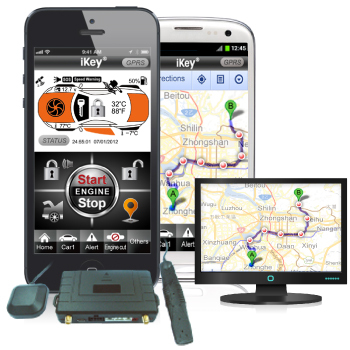 Tracks and shows trip/operation/alarm triggers history on smartphone or PC/NB. Icons display vehicle status, alarm trigger and vehicle information on smartphone. Build-in rechargeable battery, power disconnect alert. One phone can control 3 cars. One car can be remote control by multi-phone. Master and private functions selectable. Safety login code for smartphone, password for main unit. Build-in acceleration sensor, power save design, static current only about 8 mA. Comes with 1-3 years free tracking server except GPRS data SIM card. Can work with 1-way or 2-way alarm/starters that have data port. Can work with any OE or aftermarket alarms or keyless entry. 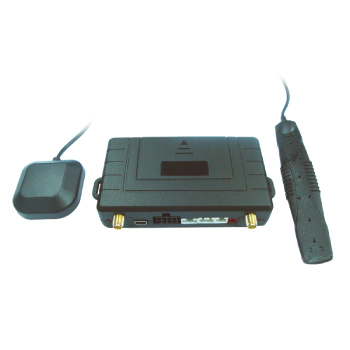 Can work with the VH740 engine starter kits to remote start engine by smartphone. Can work with UG200D upgrade alarms by using an OE remote and smartphone. Can work with CANbus/OBD II interface module to link to a car’s CANbus for remote control and display vehicle information on smartphone.